Most local businesses are not on the Internet, or if they are, haven’t been successful in website marketing. But if your business provides local services or products then your prospects aren’t using the Yellow Pages phone book, or reading newspaper ads anymore to find solutions – they’re going online. And if they don’t find you when they search – then you don’t exist – and a competitor will get their business instead of you. 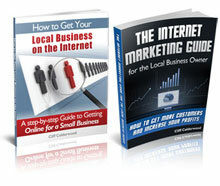 New England Local Marketing has just updated it’s free guides to help you get your local business on the Internet. They also help you unlock the secrets of getting more customers and profits using the Internet. Get complete instructions on claiming your local business listing at the major search engines to ensure nobody else “steals” your customers. Find instructions on how to optimize your local business listing so you’re found before your competitors. Learn how to optimize your web site for the local search engines so you get more people seeing your offers and converting to prospects or customers. Get instructions on monitoring your local search campaigns and online customer reviews so you know who is talking about you and what they’re saying. Introduction to Rich Snippets – the next wave in helping your business explode online. You also get our complete 20-module “The Internet Marketing Guide for the Local Business Owner” delivered to your email inbox in bite-size actionable chunks to get your business to the next level online. If you’re already on the Internet then this guide, aimed at small business owners, will show you what you need to do to get more web site traffic and more conversions to customers. As a valued subscriber we also send you important updates about local search from the search engines, and information and tips on how you can profit from local marketing of your services or products using the Internet. We also use our updates to announce additional free reports, and educational webinars and seminars, and inform you of resources and tools to get more leads and customers for your business. We never rent or sell your information. Occasionally we’ll inform you of products and services that may benefit your local business on the Internet. You can unsubscribe with one click of your mouse anytime you want, but we hope you feel the information we provide is worth staying as a free subscriber – never a penny to pay. Just complete the form below and press SEND and you’ll be asked to confirm your subscription to start receiving your FREE Guides. sell this information to anyone else. Please contact us with any questions or concerns you have.